This acrylic urethane clearcoat reaches a dust-free finish in about 3 minutes. 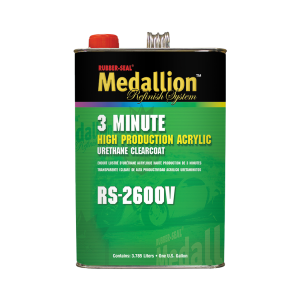 It is the ideal clearcoat for shops that have airborne dirt and overspray problems. RS-2600 is also an excellent choice as a cut-in clear or replacement parts. It is National Rule compliant and mixes 4:1 with RS-2200 series activators (RS-2260, RS-2275, RS-2285 and RS-2295). RS-2600V is available in gallons only.